My guess is that you've noticed it... the way our blog posts have gradually grown fewer and farther between. And if you're a regular reader, you may even know why. We started putting out the word back in October that we were starting a new business venture. But, we never really went into much detail about what we had up our sleeves. In some ways it feels a bit obnoxious and self-serving to talk about the business here at Burp! -- because we know that you're here for the recipes and the banter about what's going on in our kitchen. But, on the other hand, when we have a project that's taking up some much of our time, it feels pretty awful to be keeping that out of the conversation. So, without further adieu, we'd like to let you in on what's up with our new company, From Milwaukee with Love -- a food-based gift box company that focuses on artisan products made by small businesses right here in Milwaukee. I've always been a firm believer that the best way to get to know a place -- any place -- is to taste the food that it produces. It's such a powerful way to capture the cultures and spirit of the people who live in a given area -- and the foods produced in any given region are also highly reflective of the terrain, the traditions, and the deeply held beliefs of an area. I've also been saying -- for more years than I care to admit -- that Milwaukee's food scene has really become worthy of more widespread attention. Many of you also know that, through my food and dining writing for OnMilwaukee.com, I've met a lot of great chefs and food entrepreneurs -- many of whom I've gotten to know quite well over the years (you'll see a number of them pictured on the right). And I found myself frustrated that there wasn't a locally owned company that really took advantage of show-casing how awesome they really are. So, From Milwaukee with Love has become our labor of love, in a sense. It's a project that's both dear to our hearts and which supports some of our most sincerely held beliefs about supporting entrepreneurism and keeping money in the local economy. We're just starting out, but our goal is to change our selections seasonally, and really offer people a taste of Milwaukee and the surrounding areas. Around mid-April, we'll be rolling out a number of new boxes that feature a number of great new products that are just perfect for food lovers like yourselves. And, at that point, we'll be pulling together a great giveaway of Milwaukee-made products for all of you -- our loyal readers. In the meantime, we'd love to hear what you think of the concept and our current selection of products. So, please feel free to leave your comments, questions, and suggestions. So, it's officially Pi Day. Again. And, as usual, we've forgotten to make a pie. Seems it happens every year that March 14th sneaks up on us, and we're caught standing, rolling pin in hand, with not even a pie crust to show for it. 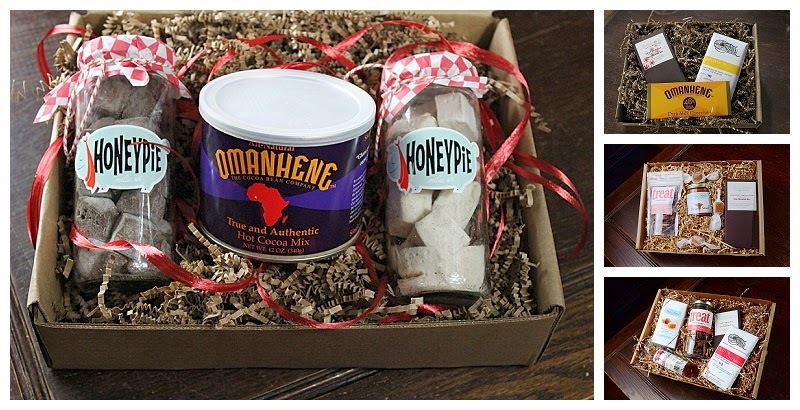 The fact that we've been super busy with the launch of our new local food gift business, From Milwaukee with Love (if you check it out, let us know what you think), hasn't helped to free up any time for pie making. Fortunately, Milwaukee has its share of excellent pie makers. So in all likelihood, before the day is through, we'll probably end up heading over to Honeypie Cafe. And, if we're lucky, they'll be serving their delicious salted honey pie. It's one of my favorite things in the world -- sweet, salty, crisp, chewy. Gosh, I'm drooling just thinking about it. But, I still feel bad for not giving you guys a pie to gaze upon. Fortunately, we noticed that the folks at Inkling (also the geniuses behind some of the coolest apps & reference platforms around) have gone above and beyond in their celebration of Pi Day. As geeks, they're probably more about the "pi" side of pie day. But, this year, they've embraced the delicious side too by featuring two recipes from the (really fantastic) Modernist Cuisine at Home - flaky pie crust and sous vide vanilla pastry cream. You should check out their post -- if only to gawk at the scrumptiousness. I don't know if we've ever mentioned our fascination with sous vide -- the modernist technique by which foods are sealed tightly in plastic bags and cooked at very low temperatures for a VERY long time. But, it's been on our minds as we watched our chef friends use immersion circulators to produce the most succulent shortribs, perfect eggs, and dreamy pork belly. 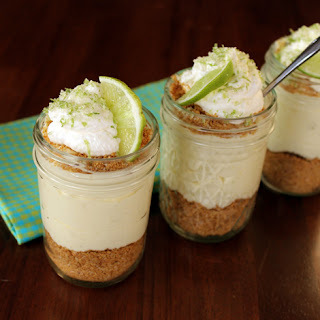 In the meantime, feel free to enjoy one of our favorite (and easiest) pie recipes - Fluffy Key Lime Pie in a Jar. It's light. And fluffy. Citrusy. And bright. And it requires no special techniques or equipment. Plus, it gets rave reviews from all of our friends and family. So, you're sure to enjoy! Here in Wisconsin, winter has been just a bit brutal. Between the "Polar Vortex" that seemed it would never end, to nearly constant 1-5 inch snowfalls, we're seriously looking forward to spring and summer. Unfortunately, we haven't really reached the point in the season where we're seeing many new spring vegetables (but, oh! what we'd give for a nice bunch of local asparagus or a few morel mushrooms...) But, our minds are still trying to conjure up a bit of warmth with the recipes we create. 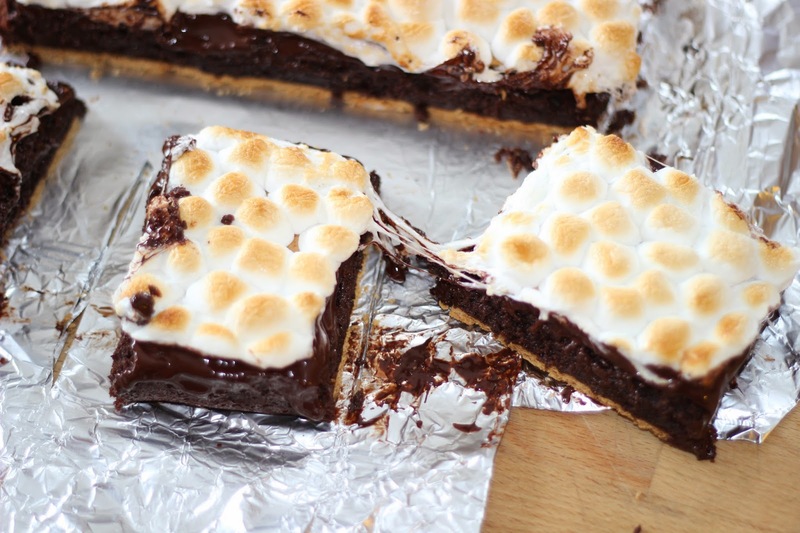 Take for instance our latest re-creation -- the s'mores brownie! I mean, why not? They're great made over the campfire, but they are even better as a brownie, right? Well, not always. 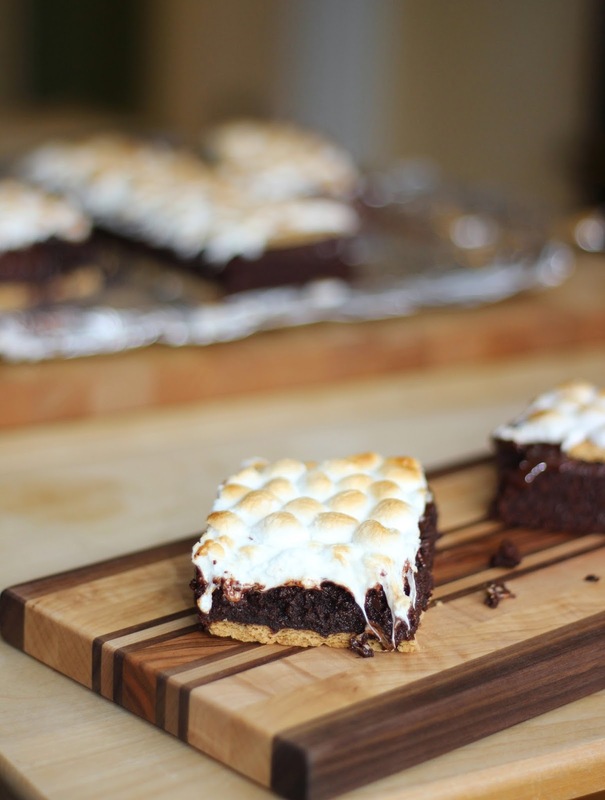 We've tried a few too many "s'mores brownies" that don't quite make the cut. Some fall short in the chocolate department (either because the brownies are too cake-y, or because the chocolate flavor falls flat). Others don't give you enough of the "crunch" factor from the graham crackers. So, we decided to come up with our own. First, we developed the fudgiest brownie we could find. Then we surrounded it with melted dark chocolate and crisp graham crackers (a top AND bottom layer) and added a top layer of gooey, perfectly browned marshmallows. Looking pretty good aren't they? They’re easiest to cut when they’re fully cooled, but our guess is that you’ll have a difficult time waiting to sample their ooey-gooey goodness. There are more great recipes where this one came from! We created this dish as part of our work with the Go Bold with Butter blog, where you'll find an amazing collection of delicious recipes using real butter. Follow Lori's board Burp! on Pinterest. All recipes are the original creations and property of the author, unless otherwise noted. Please respect our work, recipes, and writing, and refrain from posting or publishing recipes, writing, or photographs found on this site without permission or credit (see Creative Commons licensure). Use of these recipes and photographs are for personal and non-profit use only. Please feel free to contact us with any questions. 2013 ©Burp! . Powered by Blogger.